WILLS POINT, Texas, Oct. 15, 2018 /Christian Newswire/ -- A simple bar of soap is making a big difference in the lives of people in impoverished communities across Asia. Distributed by GFA-supported (Gospel for Asia, www.gfa.org) workers, it is the centerpiece of a hygiene awareness drive that improves the health and welfare of many living on the margins. Photo: Clean hands go a long way toward ensuring good personal and public health. GFA-supported workers celebrate Global Handwashing Day by conducting hygiene-awareness and training workshops at its Bridge of Hope centers around Asia. High-resolution version available. 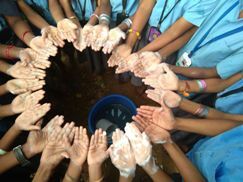 While the cleanliness campaign goes on year-round through its varied ministry-supported programs, the organization brings an additional emphasis to it to mark Global Handwashing Day (Oct. 15). The annual event, whose 2018 theme is "Clean Hands--A Recipe for Health," aims to increase awareness about the importance of handwashing with soap as an effective and affordable way of preventing sickness. To mark the day, GFA-supported teams across Asia will be holding special handwashing presentations at some of the Bridge of Hope centers they run, and also in local schools and village meeting places. of the GFA-supported medical ministry. "Yet it is possible to make significant improvements in health by taking some basic hygiene precautions. By sharing these lessons, we want to show people that God loves them and cares for their well-being." The presentation even impacted a teacher at one of the schools visited by a GFA-supported team. "Many times, I ate food without washing my hands," she said. "But I have learned today that if I wash hands properly before and after food or work I will be healthy. Thank you so much for bringing this awareness among us." GFA (Gospel for Asia, www.gfa.org) and its worldwide affiliates have--for almost 40 years--provided humanitarian assistance and spiritual hope to millions across Asia, especially among those who have yet to hear the Good News. Last year, this included more than 70,000 children, free medical services in over 1,200 villages and remote communities, 4,000 wells drilled, 11,000 water filters installed, Christmas gifts for more than 200,000 needy families, and spiritual teaching available in 110 languages in 14 nations through radio ministry.